My art/life vision is starting to manifest. A few years ago, after more than 30 years in a non-art career, I began to get a serious itch to be done with that work so that I could paint more. I continued to paint just once a week, and often blogged weekly, and late last year I sold my business. Now, I am lucky if I can get a blog written once a month, because I am painting so much more. There often is a social element to painting en plein air, several artists painting together, working silently most of the time, but supportively interacting before and after painting. I find I enjoy that aspect immensely. It can take the sting out of challenging experiences, and it can reinforce the successful ones. The former was the case when 4 of us painted at Coastal Dune Lake Appreciation Day at Grayton Beach State Park in September. The weather was threatening, and the food vendor left soon after the festival started. There event was not very well attended, and our pavilion became the gathering place for the few die-hard sponsors and supporters. But we had each other, and that kept us there painting through the drizzle. At right is the painting I completed, showing the rich reds underneath the near grasses and bushes, and the beach dunes in the background. I also enjoyed my first plein air painters trip that was independent of any festival or workshop. 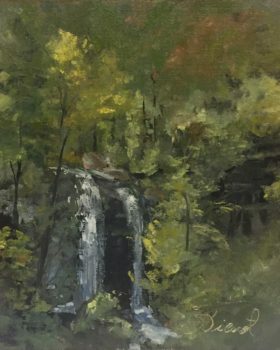 Three of us went to the mountains of North Georgia and North Carolina to paint for half a week. Our host, Theresia McInnis, had researched and mapped out a number of wonderful, scenic locations for us to paint, and we were absolutely in heaven. Below are the paintings I completed on that trip. I am happy to report that the painting titled Dry Falls sold to a tourist right off my easel.